The flow of water, ink, and watercolor on paper create serendipitous images reminiscent of landscape, both mystical and familiar. 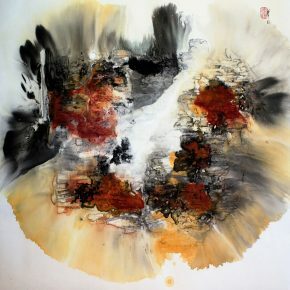 This is the world of Karen Kurka Jensen who found “the language of her soul” in the ancient Chinese art form of sumi-e. The Heber City artist was trained in the classic art of sumi-e painting in her home state of Minnesota. In the 30 years she has been practicing this art form Jensen has combined traditional elements with experiments to find her own voice. The results are stunning interpretations of the landscape – redrock formations of southern Utah and stands of aspen trees on the mountain where she lives. Some of her work may seem non-representational abstracts at first glance. Yet the colors provide clues to meaning, and when you look closely you find in the ink some definition of rocks, trees, and hoodoos. Following the Chinese tradition of leaving the white of the paper to represent air and water, Jensen’s paintings breathe in whiteness, and let the viewer feel the peace and solitude of nature. On a visit to her studio, Jensen walked me through her process, which can vary with every painting. When I read her artist statement, I understand. 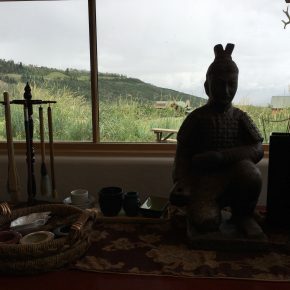 Describing her daily discipline of simply sitting, waiting, and looking at nature, Jensen writes, “I look at water, the shifting surface, reflecting, revealing, hiding, disclosing. One minute still and peaceful, showing me the secrets of its depths; the next, ripping with the breath of an oncoming storm when all images are swept away.” Such are the ways Jensen’s process may change in response to the flow of water and ink on paper, suggesting, revealing, almost hiding her subject. Sumi-e is a dance of serendipity and control. To really understand it, you’d best sign up for one of Jensen’s classes through the Kimball Art Center in Park City or through Lifelong Learning at the University of Utah. Jensen works on xuan paper, a very thin, handmade paper from China. 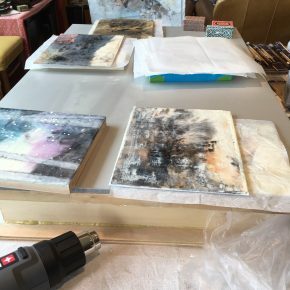 “Most of my materials come from China, Japan, or Taiwan,” she says, “because the papers there are still handmade.” These materials – paper, paint, inks – can be ordered from orientalartsupply.com. The paper is very thin and when it gets wet, it wrinkles. The ink or watercolor settling into the wrinkles is part of the uncontrolled beauty of the process. She may paint on the back as well as the front of the paper. The ink is sumi-e ink, which is water-based. She uses both Chinese watercolors, which are more intense, and western watercolors, such as American Journey brand carried by Cheap Joe’s. For example, on a hike through an aspen forest, she sketched not just the trees but the spaces between the trees. She says other artists might abstract the vertical rhythm of the forest, but she finds the variety of spaces in the trees, as captured in her sketchbook, helps her portray the energy and spirit of the trees. She may start a painting by just pouring out impressions from her walk, allowing ink to flow over the paper in water. Or she may use white gouache, milk, or soy milk as a resist, applied “playfully” in random areas to preserve the white of the paper. The resist is usually allowed to dry before flowing the water and ink. Dry paper, for example, around the edges of the paper, also acts as a resist, stopping the flow of water. She may allow the first ink to dry before adding watercolor, again with water to carry the color approximately where she wants it. Subsequent layers are added after periods of drying, using both ink and color with a brush to define or suggest shapes in the landscape. She may use white gouache in the final layers; for example, the aspen trees are pulled from the background by white gouache painted on the back and front of the paper, and calligraphic inks work to express the markings in the tree bark. Some paintings begin with a technique called suminagashi, in which the ink is floated in water and the paper is dipped in to pick up some of the ink in a kind of marbling effect. Jensen will teach this technique in a class at Kimball Art Center in October. At any stage of the painting process, when Jensen wants to stop the flow of ink and paint, she carefully lifts the paper from her plastic covered table and places it on a drop cloth where it can dry. When she is satisfied with the painting, and it is completely dry, she places it face down on her table and carefully saturates the back with wallpaper paste made of wheat. Then she presses a larger sheet of masa paper (a thicker type of Oriental paper) onto the back of the painting. After painting some more wallpaper paste around the edges of the masa paper, she lifts the painting and its masa backing to a wood board, presses the edges to the board, and allows it to dry thoroughly. Then she can cut away the glued edges of masa and the painting and its backing are ready to frame. 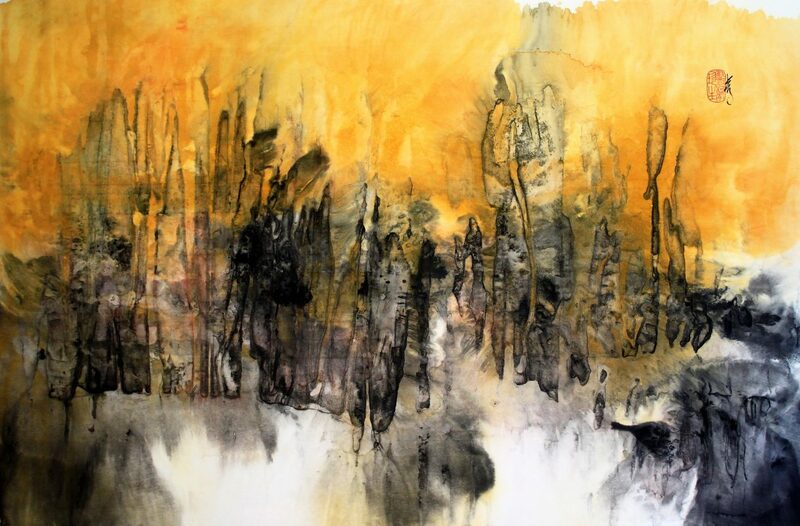 Just as the ink and colors of her paintings flow somewhat uncontrolled in water to create the shapes and textures she wants, her journey as an artist has flowed from unexpected events and encounters with people along the way. As she was beginning a career as a librarian 30-some years ago in Minneapolis, Jensen was in a five-car accident that left her with spinal injuries and pain, postponing her career for a time. When Western doctors told her she’d just have to get used to chronic pain, that there was nothing more they could do, she sought alternatives. A friend introduced her to a Chinese doctor. After more than a year of therapy, her pain was gone and life resumed. But the doctor offered more than healing and pain therapy. He introduced her to Chinese art and culture. Life and art took another turn when she moved with her husband to Iowa, where no one had heard of sumi-e, and there were no instructors or art supplies. “The librarian in me took over,” she says, “and I ordered books and began working.” This, she says, may have been the best thing that could happen because she got away from the classical training and began to develop her own style. The very spirit of the sumi-e art form encompasses change and a flowing evolution. According to Chinese master artists, it has been introduced into every country around the world over the past 5,000 years, and it has been changed in every country. About three years ago, Jensen and her husband moved to Utah. Again, her art has changed to reflect the landscape that surrounds her. 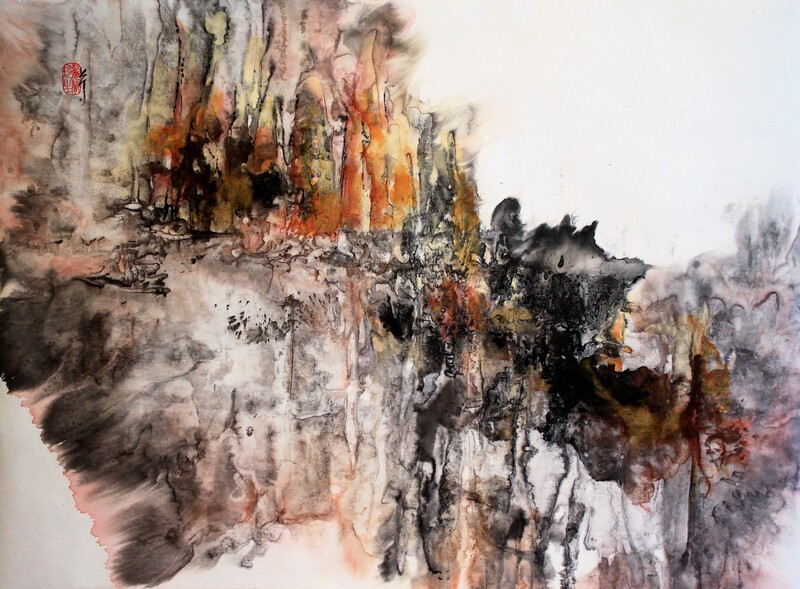 In a series of smaller paintings she calls “Utah Live,” Jensen responds in color, line, and texture to her new home. 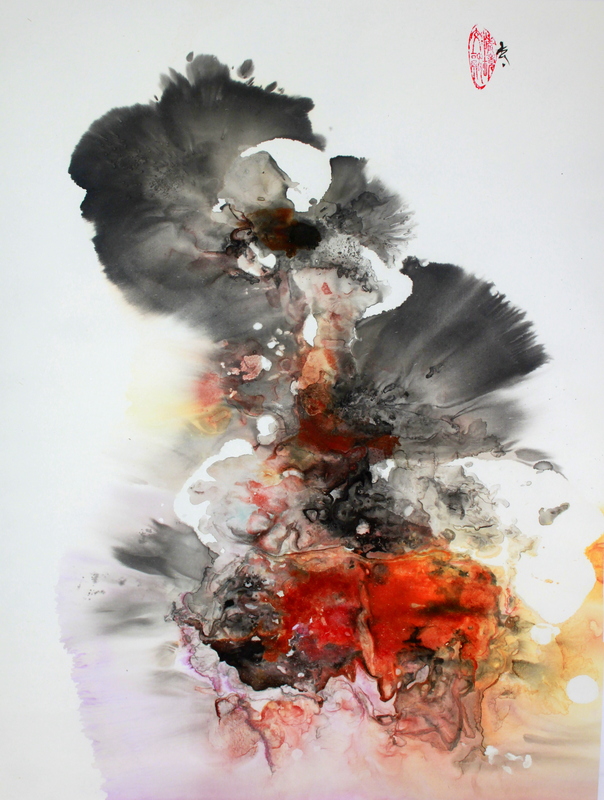 A member of the Sumi-e Society of America, Jensen won the “Founder’s Award” for her painting, “Stratosphere” in the 2016 exhibition. 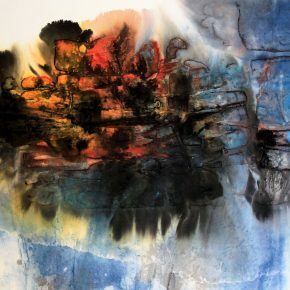 Scrolling through the society’s online gallery, one can see the great variety of approaches to art using sumi-e materials and techniques. Jensen’s work is represented by Writ and Vision Gallery in Provo; Diana West Gallery in Durango, Colorado; and several galleries in Wisconsin, Iowa, and Minnesota. Karen Kurka Jensen will teach a Sumi-e “basics” class on two Saturdays in September (16th and 23rd, 9 a.m. – 1 p.m.), through Lifelong Learning at the University of Utah (https://continue.utah.edu/lifelong/classes?s=&month_start=1709&instructor=Jensen). She will teach a one-day workshop on suminagashi at the Kimball Art Center on Oct. 21 (http://kimballartcenter.org/classes/suminagashi-japanese-marbling-workshop-2/).